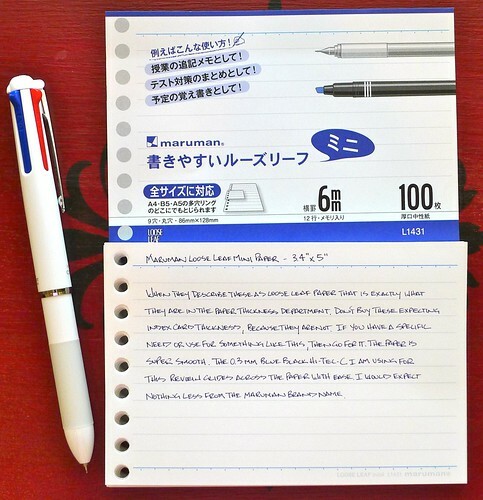 JetPens describes the Maruman Loose Leaf Mini Paper as “index cards for your binder” and that is completely accurate. Don’t go into your purchase thinking they are the thickness of an index card though - they are essentially a standard sheet of paper. What sets the Mini Paper apart thought is the quality. Maruman is one of my favorite papers to write on due to the ultra smooth feel. This makes it great for the fine tipped gel ink pens that I love so much, and perfect as a quick note taking option in your binder. While the Maruman Mnemosyne Inspiration fits my workflow better, the Mini Paper should come in handy for anyone who takes large amounts of notes, especially in a binder format. Has anyone put these to good use yet? Posted on July 11, 2012 by Brad Dowdy and filed under Maruman, Notebook Reviews.